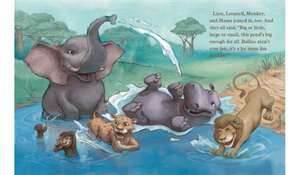 One morning Elephant went down to the pond for his bath. But who was there first? Hippo, and he was taking up a lot of space. Hippo leaves the pond, only to find Lion on the path. Since Hippo is bigger than Lion, he nudges Lion. The bullying behavior moves from animal to animal until it finally reaches Monkey. Monkey complains to his mama and she replies, “Son, you have to stand up to bullies. You go back to Leopard, and you tell him there’s enough room for two on that branch.” Mama accompanies Monkey as he nervously approaches Leopard. Monkey reminds Leopard to share and to stop being mean. Leopard is taken aback, he is suddently much less comfortable on his branch. He decides Monkey can stay on the branch and then he gets an idea. As Monkey’s message moves from animal to animal, friendships are restored and the former bullies discover it is much more fun to share. An ideal introduction to the topics of bullying and sharing, Jungle Bullies features predictable recurring text. It is a beautifully illustrated anti bullying picture book and will be enjoyed by preschool age children.